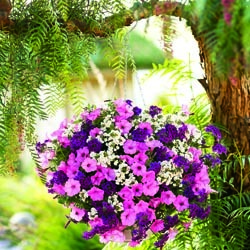 Do you want to add more plants to your yard but think you’re out of space for any more gardening? No matter how large or small your outdoor living area, no matter what types of plants you favor, you can always find the space for a new garden when it’s housed in a container – and that container doesn’t have to be the same old window box or boring planter. 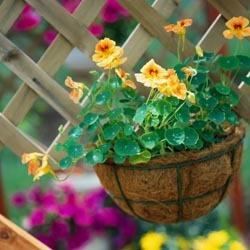 Hanging Baskets – Choose from willow, moss, wire, cocoa, resin wicker weave or rope weave baskets in different sizes, colors and styles. We also carry self-watering hanging planters and pots in several different sizes, colors and designs to suit your needs and style preferences, and to blend well into your other garden décor and accents. Pots – Shop our extensive line of hand-crafted and manufactured pottery from around the world – Italy, Malaysia, China, etc. – with unique and stunning designs and colors. Choose from a selection of clay, plastic, fiberglass, cement, tin or resin pots in various themes as well as designer and lightweight insulating pottery. Planters – Choose from our lined hayracks, cradle planters (also lined), railing, fence and deck planters as well as pot trellises and obelisks to add interesting structure and layers to different containers in your yard. Many different sizes are available to suit all your planting needs. 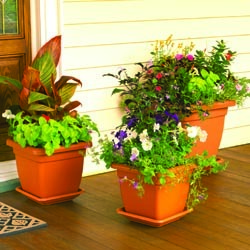 Accessories – To coordinate your décor efforts even among different pots or planters, we have saucers, caddies, plant stands and brackets, hangers, chains and s-hooks for both indoor and outdoor use so your plants are always displayed to their best advantage. Not sure what you need to give your planter the best support? We’ll help you choose the smartest and safest option. Stop by and take a look for yourself – we’re sure that you will find a container that holds your interest as well as your plants. And, of course, we also carry window boxes in different sizes, styles and designs, if you still prefer that traditional, classic look!